This recipe is from Food Network Magazine. I’m not sure I am going to renew the magazine. I get excited when I see it in my mailbox and love looking through it – only to realize that I never have any of those ingredients or the time to make them. Plus all the recipes are online. Don’t believe me? Check it out! Maybe we are too picky. I dunno. I do love that they have some real awesome recipes in it. I made Chocolate Babka from the magazine, and it looks way better than the one Panera sells. 1. Preheat oven to 450 degrees. Cut the broccoli into long spears. 2. In a large bowl, mix 2 Tb. olive oil and the broccoli. Throw a little salt on there. Roast on a baking sheet for 15 minutes. 3. In a medium bowl, mix the breadcrumbs, cheddar, scallions and nutmeg with the remaining 1 Tb. olive oil. 4. 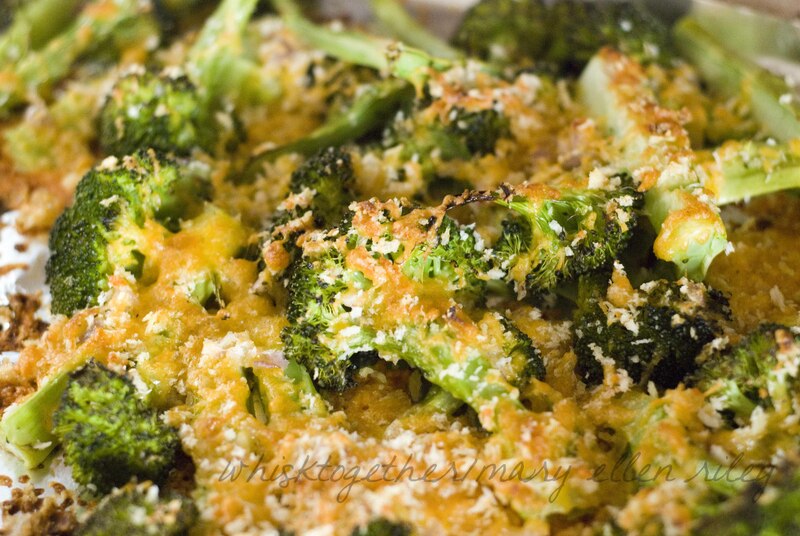 Sprinkle this on the broccoli and return to the oven for 15 more minutes.